Título Original: Ma Vie Avec James Dean. Título en Inglés: My Life with James Dean. Proyecciones / Screenings: Viernes 2 de Noviembre, Cineteca Azcona, 19 / Friday November 2, Cineteca Azcona, 19. Jueves 8 de Noviembre, Instituto Francés, 20 / Thursday November 8, Instituto Francés, 20. Version in French with Spanish subtitles. borracheras, Géraud termina encontrando inspiración en este pueblo en los confines del planeta. 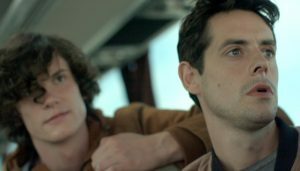 Synopsis: Invited to present his first feature film “My life with James Dean” in Normandy, the young director Géraud Champreux has no idea this film tour is about to change his life. From wild stampedes to woeful screenings, from trawler trips to drunken evenings, Géraud ends up finding inspiration in this unlikely town at the end of the earth. Productores/Producers: Nathalie Algazi, François Drouot, Marie Sonne-Jensen. Reparto/Cast: Johnny Rasse, Michaël Pelissier, Nathalie Richard.